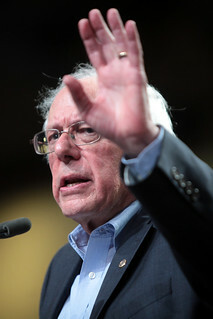 If Bernie Sanders falls short and doesn't win the Democratic Party nomination, he isn't going to be brushed aside like past runner-ups at the Democratic convention. Not since Jerry Brown in 1992 has a candidate come into the convention with an agenda for changing the Democratic Party. Howard Dean had his 50-state strategy, but his reforms were not as transformative as Bernie's. The battle for the soul of the Democratic Party has begun. If Hillary Clinton is smart, she will not attempt to stop Bernie's reforms. 2016 is about changing the status quo. If the political revolution is ignored by the party establishment in Philadelphia this July, many Sanders supporters will vote third party or stay home in November. Those who are calling for Bernie to drop out and campaign for Hillary Clinton don't understand what the Sanders campaign is all about. Bernie and his supporters want to change the system. They are tired of a rigged political process. It would be a mistake for them to surrender now without putting up a fight for change. The Democratic Party establishment should be listening. The lesson they should have learned from this year's election is that they have lost touch with a significant portion of their base and Independents. Bernie's success should be seen as a wake-up call. Reforming the party with Bernie's guidance will go a long way toward rebuilding trust with Democratic and Independent voters. Too many voters feel both parties are bought and paid for by the one percent. The political revolution is about changing that. It is not enough to pay lip service to political reform. The Sanders army will need to see real action before they will commit to supporting the party again. Here are some actions that will go along way toward rejuvenating the Democratic Party. 1. A new Democratic Party chair. A progressive leader must replace Debbie Wasserman Shultz as DNC chair. Her actions throughout the entire campaign have been undemocratic. Her handling of the debate schedule and threat to enforce one of the most undemocratic rules ever imposed by the party disqualifies her from a future leadership role in the party. To tell the candidates that they cannot participate in any debates not sanctioned by the party is authoritarian. Of course she didn't enforce the rule on Hillary Clinton, but she threatened to enforce it on Martin O'Malley and Bernie Sanders when they talked about organizing more debates. Wasserman Shultz was clearly attempting to shield Clinton from more debates. Now, out of roughly 60 spots on key committees at the convention, only three were chosen from lists submitted by the Sanders campaign. Bernie currently has an estimated 45% of the pledged delegates. The committee's make-up should reflect the results of the primaries and caucuses. At last summer's meeting of the DNC there was a motion for more debates. Wasserman Shultz ruled that the motion was out of order and that it was her decision to make. She refused to allow a vote on the issue, drawing criticism from at least two vice chairs. One of them, Rep. Tulsi Gabbard, was told by Wasserman Shultz to stay away from the Vegas debate if she couldn't stop talking about the need for more debates. Another vice chair, former Minneapolis mayor R.T. Rybak, said Debbie Wasserman Schultz was making statements that were "flat out not true" and threatening the 2016 race. "I have serious questions," Rybak said. "And it's not just about the debates. The fact of the matter is some time in a month or two before the convention, somebody is going to win or lose. It's going to be essential for the leader of the party to be able to say to everyone, look, it's been fair, we need to now, let's all pull together. That's what Democrats want. I think the only thing that's going to mess that up, frankly, is that I don't think the Chair, right now, is in the position to be that peacemaker who builds that big tent for all of us." I agree that Debbie Wasserman Shultz represents a party that is more concerned about what Wall Street wants than Main Street. The first step is that she should be removed from the party leadership. 2. All primaries and caucuses should be open. As long as our electoral system is rigged in favor the Democratic and Republican parties, they should allow Independents to vote in their primaries. Without access to that process, 40% of Americans are shut out until November, when they are stuck with a choice of only two candidates. Open primaries will result in a candidate that Independents can support in November. That can only be a good thing for the party and broadens the tent.